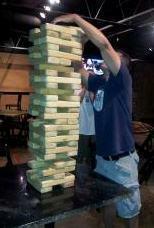 The Giant Jenga is a hit with teenagers and adults. This larger version is made with wood that is approximately 10" wide. This game is not recommended for children.